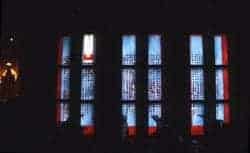 Religious stained glass windows don’t have to be loud. If there were one set windows I’d love to have near me, so that I could visit regularly, these would be it. …This one was different. I walked into the chapel at Langen, Germany, and immediately that goose bump feeling came over me. Once the obligatory photos had been taken I stayed in the quiet empty church, letting the atmosphere created by the window wash over me. It wasn’t just the quality of the light or the moving sense of community suggested by the imagery, it was the sense of calm and tentative hope emanating from the wall of colour. It was breathtaking, and even now remembering it, the emotion of the experience is evoked. It wasn’t until later on in the trip that the symbolism was explained. We were lucky enough to meet Schreiter, who told us that he’d been using the geometric U shape – white in these church stain glass windows – since 1962, and that they represented hands raised in prayer or supplication. He talked about the U shape carrying a heavy load of human guilt, which has to be exposed and confessed to both God and man before it can be opened to the light and expunged. The column of light at the top left of the window indicates the optimism of such a message. Pretty heavy stuff, and I’m glad to have experienced it in ignorance first before learning more about these moving windows. Amazingly, for such a fantastic and influential artist, I couldn’t find that much of interest on the web. There’s a small Flickr gallery, attributed to Keith Gale, interesting work as always, but not much of his religious work is included. There’s also an outline of Schreiter’s career by Caroline Swash if you’d like to read more about him.